Imagine a bed of thinly sliced potatoes roasted in olive oil and oregano until crispy and brown. Yum, right? 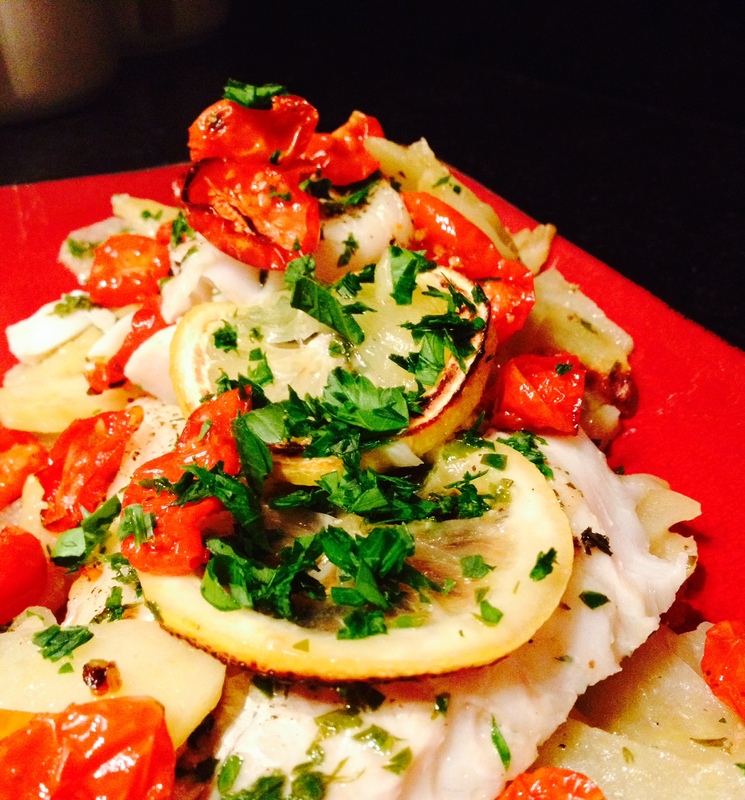 Now imagine a flaky, lemony cod fillet on top. Extra yum! I also added some roasted grape tomatoes, but those are optional. It’s lovely just on its own. Add 4 T. olive oil to your casserole. As you thinly slice the potatoes, add them to the casserole and stir to coat them with the olive oil. (This helps to keep them from turning brown when exposed to oxygen as you are working.) Add the oregano and sprinkle liberally with sea salt + freshly ground pepper. Mix all together well. Spread in as thin a layer as possible in the casserole, and bake for about 40-45 minutes. The potatoes should be cooked through (soft when you pierce them with a knife) and starting to brown. If you are making the roasted grape tomatoes: Halve your grape tomatoes, toss with 1 T. olive oil, 1 T. sherry vinegar, maybe a little oregano if you have extra, and salt and pepper to taste. Spread in a single layer on a non-stick cookie sheet (I use a silpat liner because it gets kinda sticky) and add to the oven along with your potatoes. The tomatoes should take about 20-25 minutes to turn roasted and wrinkly and caramelized. Remove potatoes and tomatoes from oven and preheat the broiler (make sure there is about 5-6″ of clearance for your dish). 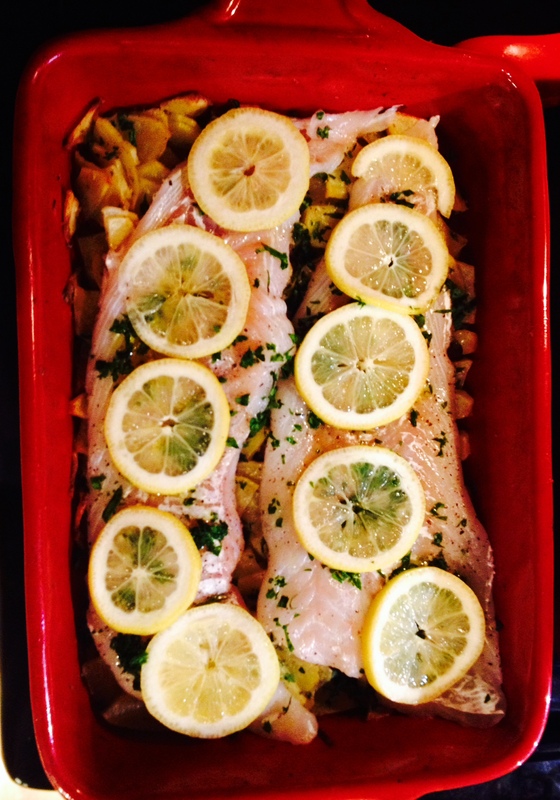 To serve: Remove any lemons that got singed, and carefully run a spatula under the fish and potatoes. Try to lift a whole fillet out with its underlying potatoes (I ended up using two spatulas, one for each end of the fillet). Top with the roasted grape tomatoes if you made them. Sprinkle with chopped fresh parsley if desired. Enjoy! !